In honor of my husband, who celebrated his birthday this weekend, here is a little story about his mom. 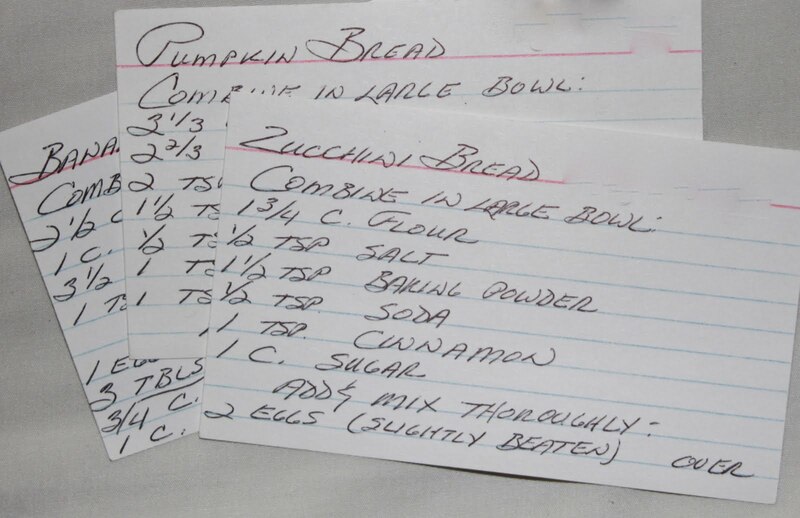 One day, she sent him a note (he lived about 60 miles or so from her) and included 3 recipes, written out on index cards. They were for zucchini bread, pumpkin bread, and banana bread. These were definitely things that she had baked for her family over the years, but she wasn't a huge baker. She was more of a spaghetti night, taco night, kind of mom. They ate family meals together growing up, but nothing gourmet or fancy. Just yummy and filling. 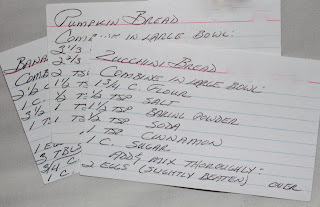 These recipes are the same... there is nothing particularly special about her breads. They are just what you want pumpkin and zucchini and banana bread to be. Delicious, sweet, and familiar. I don't think he asked for these particular recipes. I imagine that she just thought it would be a good thing for him to have... maybe in a moment of missing her son, or of wanting him to have a little taste of home. Maybe she knew how little money he was trying to survive on (as a university researcher just out of college), and thought that he might want to be able to have a cheap treat. Whatever the reason, as it turned out, these three recipe cards would end up being the only things he has that have her handwriting. I don't think she knew that... I don't think he realized it until he came across them, stored in a desk, much much later. But as it turns out, the comfort of the warm tasty bread is only as important as the recipe itself. She died a few months later, after battling cancer for years and years.